I would take a deep inhale and the immediate smell of the sea and salt in the air would wake me up and make me giggle with excitement as it cooled me. His love for the ocean was the reason I forced down my first squishy bite of calamari, it was the reason my sister, cousin, and I would wake up at 4 in the morning to catch the all-day fishing boat in San Pedro. And with a fishing pole bigger than I was, he taught me the strength, beauty, and mysteries of the sea. He is the reason, to this day, I know you should only eat seafood in a place where you can see the ocean. (I doubt he would consider the Hudson River a feasible excuse to eat oysters on Grand Banks... but I digress). In his honor, no matter which beach town I’m visiting from Portugal to Hawaii... I always go on a hunt to find the freshest seafood I can, and this lovely meal was my latest jackpot served up in Esperanza at a local joint called Bili’s. 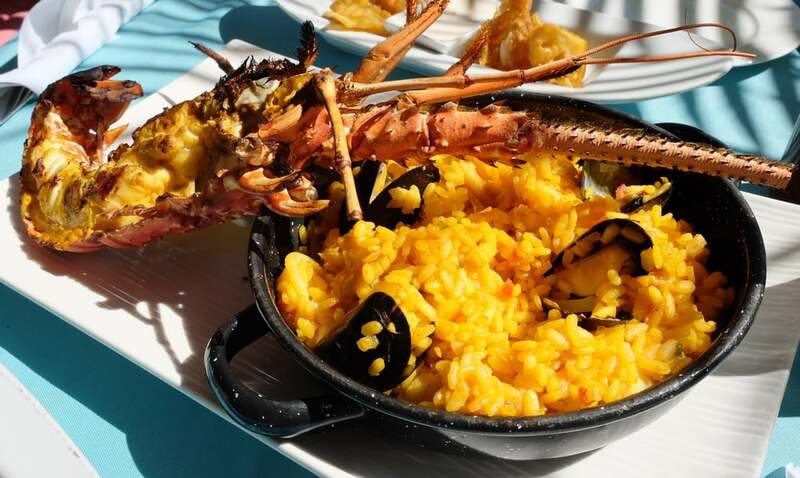 This place was the recommendation of the local friend I had made earlier in the day, and we ordered the calamari, the poke tuna, and the daily paella which came complete with a half lobster. My love and fascination in finding the most incredible beaches, is always backed by a quest for equally outstanding seafood thanks to my diehard, ocean loving, fisherman for a Grandpa. And I have to say, I think this little pastel ramshackle in southern Vieques would've been right up his alley.